Having just set down 'Tokyo Ghost' #5 after reading it and picking my jaw off the floor I can report that the end of the first arc is a melancholy explosion the size of an atomic bomb. It ends in ways I feared it could and not only were my fears realized they were multiplied a hundred times over. Rick Remender, Sean Murphy, and Matt Hollingsworth have just orchestrated a bombastic spectacle that thrills while stabbing you in the heart. Led Dent is back, Teddy is but a memory, and he's high on that good juice with Davey Trauma back in his ear. He's run amok and destroying everything in sight just as he was sent to do. Meanwhile, Debbie is distraught with Kazumi precariously hanging on to life and rife with guilt for all that has befallen the Gardens. The dream of a peaceful and serene life with Teddy suddenly crushed to pieces. We finally understand Kazumi's power and her connection to the island. Debbie reluctantly picks up her sword and all the weight it carries. She knows she has to stop Dent before he causes more pain and total annihilation. She does so with a heavy heart, sadly looking for a sign that Teddy is still there within him, a salvageable piece of humanity. Her narration is heartbreaking, realizing what she has unleashed on the kind people of Tokyo Gardens. Remender takes that frenetic approach he installed in the first issues to issue five with a vengeance. The ending is a runaway freight train and Sean Murphy is your happy conductor. 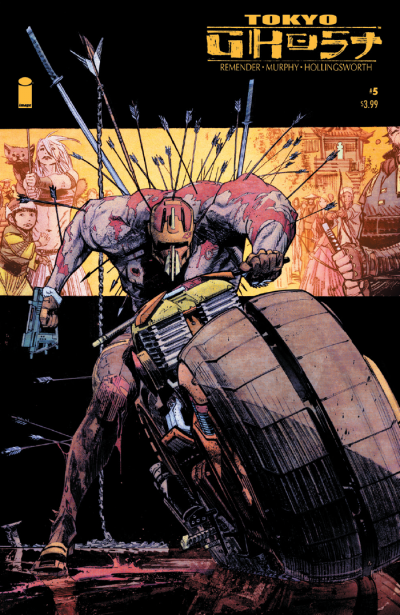 Along with Matt Hollingsworth colors, Murphy conjures up a roaring masterpiece of bittersweet devastation that Mad Max: Fury Road director George Miller would be proud of. There just aren't enough superlatives for the work Murphy continues to do. Each page, each panel is an eye-popping display of astonishing craft and controlled chaos that you can't imagine anyone else wreaking havoc in a comic like Murphy. Yet, none of the exhilarating action dulls the emotional impact of a paradise lost as the grating voice of Davey Trauma echoes in the aftermath. Debbie is torn apart emotionally throughout, Dent is a single-minded monster and the world will never be the same again. It's a hell of a cliffhanger to leave fans on because the next arc doesn't arrive until the spring. It gives Remender and company more time to think of new ways to blow our minds when 'Tokyo Ghost' continues.